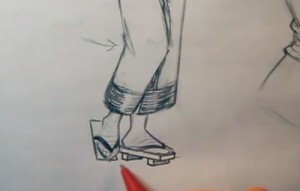 When learning how to draw a Geisha girl, use simple geometric shapes to add some shoes to the bottom of the feet that will fit the style of the character. 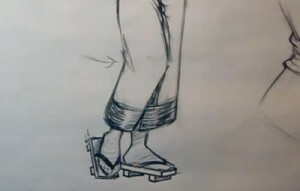 Remember that you can define the surface lines along the feet just like you have done with the other body parts to determine where and how to place the shoe straps. To make the second shoe more interesting, place it slightly off center, as if it is just dangling beside the foot, and anchored into position only by the toe strap. 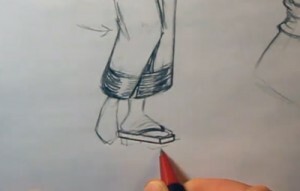 This is the last step for the how to draw a Geisha girl hair and clothing series. Add a little bit of shading to the shoe behind the heel. Then add some thickness to the shoe using very basic perspective techniques and you’re almost done. The last thing to add is two more little blocks to the very bottom of this shoe and that’s it! We hope you learned a lot in this series on how to draw a Geisha girl, and we’ll see you at the next one!